Tomorrow you will bring the battle to the foe. Tonight you walk among the troops you'll lead. The mercenaries are veterans and sleep while they can, but the peasants levied from your lands seek courage in tales of your previous victories. In the cover of darkness, you can listen rather than lead. Remember when you were like them? Back when you first entered the dungeon, you wielded a sword to fight for gold, glory, and the favour of the gods. Winning these earned you a throne. Now you wield an army, and fight for the right to rule the domains at war. 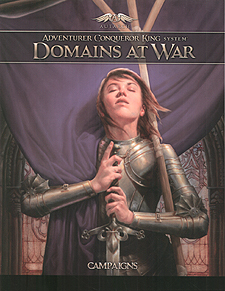 Domains at War is the mass combat supplement for the Adventure Conqueror King System (ACKS) role-playing game. The rules of Domains at War are divided into two books: Campaign and Battles. Using Domains at War: Campaigns, your fantasy RPG characters can raise armies, campaign against enemy forces, and conquer domains. It includes a comprehensive campaign toolkit for use in ongoing games, fully compatible with ACKS's rules for mercenaries, strongholds, magic, and rulership. If your players are ready to rule, then your campaign is ready for the Domains at War: Campaigns rules. Together, Domains at War: Campaigns and Domains at War: Battles give you everything you need to bring the epic scope of warfare to your tabletop RPG campaign. Domains at War is compatible with any fantasy RPG system that uses twenty-sided dice and shares concepts like hit points and armour class.